Before we can get your Museums at Night event on our database, we need to get your venue registered. We already have over 6000 UK museums, galleries, libraries, archives and heritage sites listed on Culture24.org.uk – go to the site and use the search box to see if your venue is one of them. If your venue is already listed, but you personally don’t have a login to update the record, fill in this form to get a login for yourself. If your venue isn’t listed yet, please fill in this form to join the network. Once your venue is up, and you’ve got login details it’s simple to get your event on the system. 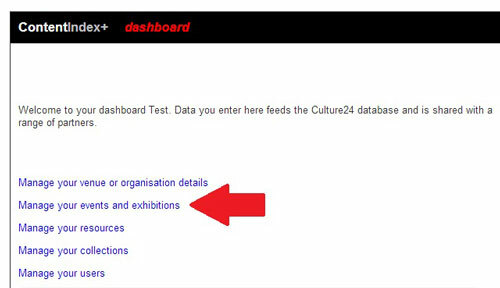 When you want to add events into the database, head to the dashboard (http://update.culture24.org.uk/dashboard) and sign in. You can also get to this link from “Update Your Info” in the footer of every page on Culture24. To add an event, click on the Manage your events and exhibitions link. Then fill in the event-adding form with as many details as possible. Make sure to include the date and time that your event starts and ends. 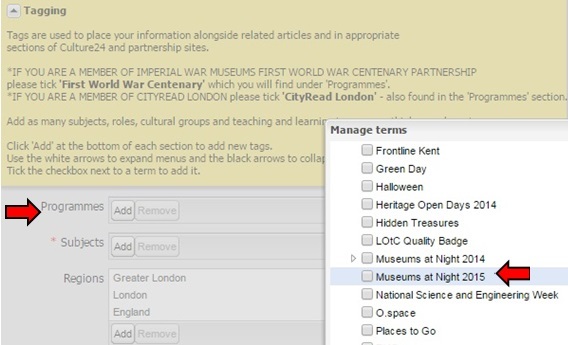 To help search engines find your event listing, please try and include the phrase “Museums at Night” in the event description somewhere to help identify it. Once you have finished, scroll down to the bottom of the form and click Save. It will appear on Culture24 the next time we publish the site: this usually happens twice a day. Again, if you have any questions, please contact the team on 01273 623266 and we’ll be happy to help.